In Mahler and his World Karen Painter explores Mahler’s Eighth as one manifestation of a mass culture that sprang into being with industrial and political upheaval. 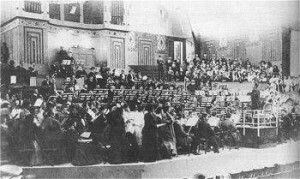 The 1910 premiere took place in Munich’s brand new Musikhalle, accommodating not only 1016 performers but 3200 audience members, and reception – understandably awed or repelled by the sheer size of the piece – focused on whether the composer’s new idiom represented a positive engagement with the man on the Munich omnibus, or betokened a vulgar, misbegotten appeal to popularism. Had Mahler sold out? What came across strongly in the Philharmonia performance at the Royal Festival Hall on 30 June was that it’s Mahler’s most synthetic work – no mean feat in a personal style already distinguished by the deliberate mix of high and low idioms. Esa-Pekka Salonen’s septet of soloists freely employed the verismo airs of Leoncavallo and Mascagni – music under Mahler’s skin as the greatest opera conductor of his day – whose swoops and strains would be so alien to the composer’s earlier, Lieder-centred vocal music, but seem to suit the Eighth’s purpose admirably. Meanwhile the intensive study of Bach undertaken by Mahler in the years following 1907 is put to hectic use in the tangled counterpoint of choral exaltation; his beloved Berlioz is there, of course, especially the Damnation of Faust(hardly coincidentally) in the otherwise puzzling string of arioso numbers that loosely form the central narrative of the second part; and every now and again, a window on to the future such as the deracinated texture against which poor Pater Profundus must pitch his sevenths and ninths, a Wozzeck avant la lettre. Could you call it a symphony? Salonen played a flamboyant traffic cop, pressing through Part I and conjuring local colour from Part II with speeds and shifts that made sense for practical and dramatic purposes, while playing fast and loose with the letter of the score. The steady end to Part I, which usually finishes with an infinite staircase of ecstasy, made a fitting culmination to a movement that is neatly summed up by one early account of the Musikhalle itself and its ‘sober, circuslike iron structure’. The final apotheosis, eternal womanhood and all that, was dragged out/lifted to absurd/heavenly lengths according to taste. Cue standing ovation. Whether Mahler’s aim that I should take it intensely seriously was thwarted by Salonen or the piece itself, I couldn’t say, though as Painter remarks, both the Seventh and Eighth symphonies are ‘works often seen as a decline, at least in the depth and complexity in expressive content, from a listener’s perspective’ and from which one supposes such a facile view would maintain Mahler staged a miraculous recovery in the Ninth, doubtless under the shadow of death that had haunted the Sixth. Bernard Haitink, like Claudio Abbado, is a great Mahler conductor of our time who has harboured persistent doubts about the value of the Eighth (expressed in printed conversation with Donald Mitchell, for one) as a cultural celebration. He has conducted it only twice. He has no such reservations about the Seventh to judge from his consistent championship of a work often seen as still more diffuse than the Eighth, renewed with the orchestra of the Royal College of Music on 16 June. I remember the Times reviewer of the first concert performance I attended – with the LPO and, yes, Haitink, 25 years ago – remarking that the first movement’s effortful journey towards its peroration could have been written by a pupil trying to be Mahler. Not at the RCM. Over the years Haitink’s tempi have become tighter, drawing together the threads of musical thought in ways resistant to extra-musical interpretation in this most extra-musical of composers. The RCM orchestra followed with a will, if without the finesse of the Philharmonia or indeed the startling command of their Bruckner Eighth under Haitink two years ago. But then, Mahler 7 is almost stupidly hard to play. The relatively cramped acoustic of the Amaryllis Fleming Hall concentrated Mahler’s decibel levels to a point where it became such an effort to listen within the glinting textures that one sat back and enjoyed the noise, whereupon the ‘exciting and witty game’ of the finale, according to Paul Banks’s programme note, snapped into focus. Maybe it isn’t Mahler who cannot celebrate, but we who find it hard to celebrate with him. Posted on July 1, 2014 July 10, 2014 by Peter Quantrill	Bookmark the permalink.